“Keep pushing No Gi like we pushed No Rules” elated Helio Gracie at Rorion’s first tournament in 2003, through his son, Rorion Gracie’s translation. It was one of the most special days of MY life. I miss you Grand Master Helio, thank you for facing adversity for all of us to be BLESSED with Jiu Jitsu. I vow to keep making you proud and keep pushing No-Gi to the World stage with Grapplers Quest Worldwide! Brian Cimins: Mr. Rorion Gracie, in less than 3 weeks, your son will participate in what many are calling the Grappling Superfight of the Year. How does it make you and your family feel to participate at the premier submission grappling event in America, Grapplers Quest on November 6th in Las Vegas? Any comments about Grapplers Quest events in general? Rorion Gracie: Grapplers Quest has earned its reputation as one of the best no gi competions around and has done a lot to promote the grappling arts. Brian Cimins: Is it true that your father, Helio Gracie will be attending this event? Will you and Helio be available for photos and autographs after the match? 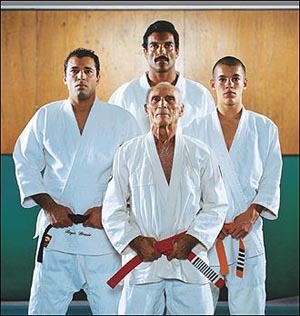 Rorion Gracie: Yes, my father, Helio is attending Grapplers Quest. We always try to accomodate such requests. Brian Cimins: How long has your son, Ryron been training for this match and what are you doing differently to prepare for Marc Laimon? Rorion Gracie: Ryron has been doing his regular tournament routine. Brian Cimins: What does competing against one of the best grapplers in America mean for you, your son and his career? Rorion Gracie: If he thinks he is one of the best, he should agree to fight with no poins and no time limit. As for the significance of this fight in Ryron’s career, it it just another match. Brian Cimins: Does it concern you that Marc Laimon knows your style of Gracie Jiu Jitsu? Rorion Gracie: Can you imagine if he didn’t? Brian Cimins: Please comment on the overall IGJJF rules of the match and the following statement by Marc Laimon, “I would like to know exactly what Ryron will wear. Training for Gi and no gi are 2 different sports. He already has special Gracie (IGJJF) rules, why not tell me what I am fighting against. Imagine if you show up to the world series, and the umpire says, “Today we will play using a softball”. It is the same game, but the dynamics change dramatically. It should be stated what your opponent will wear! Rorion Gracie: Marc, regardless of Ryron’s outfit, expect the worst! Brian Cimins: A 30 minute time limit? Will this help or hurt Ryron? Rorion Gracie: I wish Marc, who predicted victory, would show his confidence by agreeing to no points and no time limit. Last man standing kind of a deal, I am sure the public wouldn’t mind. Brian Cimins: What do you think of the slamming rule? Why allow it? Do you think it will assist in the growth of the future of jiu jitsu if people get hurt, like Cameron Earle did? Rorion Gracie: I think it is an important rule! Aside from punching and kicking, people shoud train Jiu-Jitsu on a regular basis to prepare for real fighting. Cameron (Earle) is a good fighter who made a mistake. If he learned from it, the lesson was priceless. Brian Cimins: What would you tell people who are on the fence whether or not to attend this tournament to witness this fight LIVE? Rorion Gracie: They should come (to Las Vegas) and see a great match. Brian Cimins: What is your prediction of the match? Rorion Gracie: I expect Ryron to do well as always. Brian Cimins: Any sponsors to thank?